The 29th Infantry Division (29th ID), also known as the "Blue and Gray Division", is an infantry division of the United States Army based in Fort Belvoir, Virginia. It is currently a formation of the U.S. Army National Guard and contains units from Virginia, Maryland, Kentucky, North Carolina, and West Virginia. Formed in 1917, the division deployed to France as a part of the American Expeditionary Force during World War I. Called up for service again in World War II, the division's 116th Regiment, attached to the First Infantry Division, was in the first wave of troops ashore during Operation Overlord, the landings in Normandy, France. It supported a special Ranger unit tasked with clearing strong points at Omaha Beach. The rest of the 29th ID came ashore later then advanced to Saint-Lô, and eventually through France and into Germany itself. Following the end of World War II, the division saw frequent reorganizations and deactivations. Although the 29th did not see combat through most of the next 50 years, it participated in numerous training exercises throughout the world. It eventually saw deployments to Bosnia (SFOR10) and Kosovo (KFOR) as command elements, and units of the division continue to deploy to locations such as Guantanamo Bay Naval Base and to the War in Afghanistan as a part of the Global War on Terrorism's Operation Enduring Freedom, and also to the Iraq War, as a part of its Operation Iraqi Freedom and Operation New Dawn. In 2016, two separate elements of the 29th deployed overseas. In July more than 80 soldiers deployed in support of anti-ISIL operations (dubbed Operation Inherent Resolve by the U.S. government). In October, more than 450 29th soldiers deployed in support of Operation Spartan Shield. As the ships were traveling to the beach, the heavy seas, combined with the chaos of the fighting caused most of the landing force to be thrown off-course and most of the 116th Infantry missed its landing spots. :95 Most of the regiment's tank support, launched from too far off-shore, foundered and sank in the channel. The soldiers of the 116th Infantry were the first to hit the beach at 0630, coming under heavy fire from German fortifications. Company A of the 1st Battalion, 116th Infantry, from the Virginia National Guard in Bedford, Virginia was annihilated by overwhelming fire as it landed on the 116th's westernmost section of the beach, along with half of Company C of the 2nd Ranger Battalion which was landing to the west of the 116th. :98 The catastrophic losses suffered by this small Virginia community led to it being selected for the site of the National D-Day Memorial. The 1st Infantry Division's forces ran into similar fortifications on the eastern half of the beach, suffering massive casualties coming ashore. 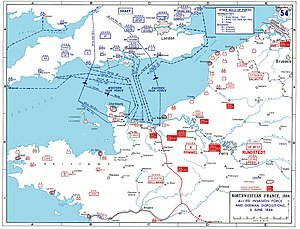 By 0830, the landings were called off for lack of space on the beach, as the Americans on Omaha Beach were unable to overcome German fortifications guarding the beach exits. Lieutenant General Omar Nelson Bradley, commanding the American First Army, considered evacuating the survivors and landing the rest of the divisions elsewhere. :29:100 However, by noon, elements of the American forces had been able to organize and advance off the beach, and the landings resumed. :103 By nightfall, the division headquarters landed on the beach with about 60 percent of the division's total strength, and began organizing the push inland. On 7 June, a second wave of 20,000 reinforcements from both the 1st and 29th Divisions was sent ashore. By the end of D-Day, 2,400 men from the two divisions had become casualties on Omaha Beach. :106–7 Added to casualties at other beaches and air-drops made the total casualties for the Normandy landings 6,500 Americans and 3,000 British and Canadians, lighter numbers than expected. Memorial of the 29th Infantry Division's embarkation for D-Day in Trebah, United Kingdom. A 2005 oil painting depicting soldiers from the 2-124th participating in the 2003 invasion of Iraq. 29th Infantry Division soldiers conduct a large-scale exercise at Camp Bondsteel, Kosovo in May 2009. 29th Infantry Division sergeant in Afghanistan as part of the International Security Assistance Force, 2011. In March 2004, the 3rd Battalion 116th Infantry of 500+ soldiers was mobilized for 579 days in support of Operation Enduring Freedom - Afghanistan. Following 4 month train up, the battalion deployed to Bagram Air Base Afghanistan where the unit split into two operational elements. One element was stationed at Bagram where they were responsible for near base security and the theater-north Quick Reaction Force. They executed 5, 10, and 20 kilometer ring patrols to increase force security and stayed ready to react at a moments notice to deploy anywhere in Afghanistan to react to "troops in contact" that requested support. The other element moved south with the Bn Commander to control and shape operations in the Wardak and Ghazni provinces. It was here that the 116th would take its first casualties by enemy contact since World War II. 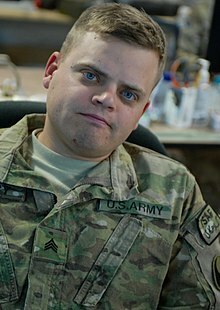 SGT Bobby Beasley and SSG Craig Cherry were killed in an IED attack on a patrol in southern Ghazni near Gilan. Within the first three months, the unit would deploy nearly every soldier around Bagram, and throughout the Wardak and Ghazni provinces during the first Afghan elections in which President Hamid Karzai was elected. The unit would redeploy back to the United States in July 2005 highly decorated for its efforts during their mission following hundreds of successful combat patrols and engagements. After a three-month pre-deployment train-up at Mississippi's Camp Shelby, the 116th Infantry Brigade Combat Team deployed to Kuwait and Iraq in September 2007, as part of the Iraq War's Operation Iraqi Freedom, returning home in May 2008. On 19 December 2016 the 29th Infantry Division assumed command of U.S. Army Central’s intermediate division headquarters, Task Force Spartan, at Camp Arifjan, Kuwait. This deployment includes 450 Virginia, Maryland and North Carolina Army National Guard soldiers and is the first time the 29th Infantry Division has been a part of Third Army since 1944, during WWII. More than 80 members of the 29th deployed to Jordan in August 2016 where they assumed command of the military’s joint operations center there to support Operation Inherent Resolve. Soldiers of the 29th led engagements and joint training with the Jordan Armed Forces and allied countries before returning in July 2017. 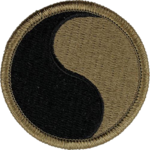 Meritorious Unit Commendation 2017 Embroidered "SOUTHWEST ASIA 2016-2017"
The 29th Infantry Division has been featured numerous times in popular media, particularly for its role on D-Day. The division's actions on Omaha Beach are featured prominently in the 1962 film The Longest Day, as well as in the 1998 film Saving Private Ryan. Soldiers of the division are featured in other films and television with smaller roles, such as in the 2005 film War of the Worlds. The 29th Infantry Division is also featured in numerous video games related to World War II. The division's advance through Normandy and Europe is featured in the games Close Combat, Company of Heroes and Call of Duty 3, in which the player assumes the role of a soldier of the division. A number of soldiers serving with the 29th Infantry Division have gone on to achieve notability for various reasons. Among them are highly decorated soldier Joseph A. Farinholt, soccer player James Ford, United States federal judge Alfred D. Barksdale, and historian Lawrence C. Wroth, generals Milton Reckord, Norman Cota, Charles D. W. Canham, and Donald Wilson. Major Thomas D. Howie who commanded 3d Battalion, 116th Infantry during the battle of St. Lo became immortalized as "The Major of St. Lo" for the honors rendered to him after being killed in action. U.S. soldiers who received the Medal of Honor during service with the 29th Infantry Division include Henry Costin, Earle Davis Gregory, and Patrick Regan  from World War I and Frank D. Peregory and Sherwood H. Hallman. from World War II. ^ a b Tan, Michelle (8 August 2017). "FORSCOM Commander: 'We Are Not In An Inter-War Period'". Defense News. ^ Tan, Michelle (7 August 2017). "More than 450 Guard soldiers to deploy to the Middle East". Army Times. ^ Reports, Staff. "Fort Belvoir-based 29th Infantry Division to mobilize on federal active duty". Virginia National Guard. ^ a b c d e f g h i Wilson, John B. (1999). "29th Infantry Division". Armies, Corps, Divisions, and Separate Brigades. United States Army Center of Military History. ASIN B000OJKX1S. ^ a b "29th Infantry Division". The U.S. Army Institute of Heraldry. Archived from the original on 20 October 2016. Retrieved 11 November 2012. ^ a b c d e f g h i j k l m Army Almanac: A Book of Facts Concerning the Army of the United States. United States Government Printing Office. 1959. pp. 531–32. ASIN B0006D8NKK. ^ a b c d e f g h i j k l "GlobalSecurity.org: 29th Infantry Division". GlobalSecurity.org. Archived from the original on 24 June 2009. Retrieved 2 July 2009. ^ a b c d McGrath, John J. (2004). The Brigade: A History: Its Organization and Employment in the US Army. Combat Studies Institute Press. ISBN 978-1-4404-4915-4. ^ a b c d e f g h Order of Battle of the United States Army: World War II European Theater of Operations. Department of the Army. 1945. p. 128. ISBN 978-0-16-001967-8. ^ a b c Hart, Russell (2003). The Second World War, Vol. 6: Northwest Europe 1944—1945. Osprey Publishing. ISBN 978-0-415-96850-8. ^ a b c d e f g h Van Der Vat, Dan (2010). D-Day: The Greatest Invasion-A People's History. Madison Press Books. ISBN 978-1-897330-27-2. ^ a b Stewart, Richard W. (2005). American Military History Volume II: The United States Army in a Global Era, 1917–2003. Army Historical Series. United States Army Center of Military History. pp. 148–49. ISBN 978-0-16-072541-8. ^ a b c d Whitaker, Denis; Shelagh Whitaker; Terry Copp (2004). Normandy: The Real Story. Random House, Inc. ISBN 978-0-345-45907-7. ^ "29th Infantry Division: A Short History of a Fighting Division - Joseph H. Ewing - Google Books". Books.google.com. Retrieved 24 December 2015. ^ "Military News". Stafford County Sun. 22 January 2009. Archived from the original on 11 August 2014. Retrieved 21 August 2009. ^ "Yama Sakura tests U.S. Army, Pacific's new command posts". U.S. Army Homepage. 10 December 2008. Retrieved 26 July 2015. ^ "Md. Vets Return to France for 60th D-Day Anniversary". Associated Press. Archived from the original on 16 September 2017. Retrieved 21 August 2009. ^ LeDoux, Julia (12 July 2007). "Battalion holds its first change of command". The Fort Belvoir Eagle. Retrieved 6 August 2014. ^ "29th Division ADAB says farewell during ceremony". Vko.va.ngb.army.mil. 4 November 2010. Archived from the original on 15 March 2016. Retrieved 24 December 2015. ^ Virginia National Guard. "Freedom Salute honors 29th Infantry Division service in Afghanistan". Vaguard.dodlive.mil. Retrieved 24 December 2015. ^ "Soldiers from the 29th Infantry Division return from duty in Afghanistan". Vko.va.ngb.army.mil. 27 October 2011. Archived from the original on 4 March 2016. Retrieved 24 December 2015. ^ Virginia National Guard (29 June 2012). "29th ID Soldiers return to Virginia after federal duty in Afghanistan". Vaguard.dodlive.mil. Retrieved 24 December 2015. ^ Virginia National Guard. "29th ID Soldiers in Afghanistan serve at National Military Command Center". Vaguard.dodlive.mil. Retrieved 24 December 2015. ^ "29th ID Soldiers in Afghanistan serve at National Military Command Center". Vko.va.ngb.army.mil. 13 February 2012. Archived from the original on 4 March 2016. Retrieved 24 December 2015. ^ "Major Robert J. Marchanti". Md.ngb.army.mil. Archived from the original on 24 December 2015. Retrieved 24 December 2015. ^ Virginia National Guard. "29th ID officer from Maryland National Guard identified as casualty in Afghanistan". Vaguard.dodlive.mil. Retrieved 24 December 2015. ^ "SHAPE - SHAPE". shape.nato.int. ^ Sgt, Master. "29th ID Soldiers travel to Germany to help train up next KFOR rotation". Vaguard.dodlive.mil. Retrieved 24 December 2015. ^ Virginia National Guard. "29th ID teams up with partners from other states to help train next KFOR rotation". Vaguard.dodlive.mil. Retrieved 24 December 2015. ^ Virginia National Guard (1 October 2013). "29th ID Soldiers support domestic response exercise in Maine". Vaguard.dodlive.mil. Retrieved 24 December 2015. ^ "Domestic All-Hazards Response Team". army.mil. Stand-To!. 19 October 2009. Retrieved 19 October 2009. ^ Coyne, A.J. "Ortner takes command of 29th Infantry Division". Vaguard.dodlive.mil. Retrieved 24 December 2015. ^ "29th Infantry Division begins mission in the Middle East". Vaguard.dodlive.mil. Retrieved 21 December 2016. ^ "Torchbearer Special Report" (PDF). Association of the US Army. 7 November 2005. Archived from the original (PDF) on 12 November 2011. Retrieved 2 October 2012. ^ "About the 29th CAB – 29th Combat Aviation Brigade Maryland Army National Guard". 29cab.org. Archived from the original on 25 July 2010. Retrieved 22 December 2010. ^ annual_report.indd Archived 4 July 2010 at the Wayback Machine. (PDF) . Retrieved on 14 August 2010. ^ "Fort Sill - Oklahoma - Fires Center of Excellence" (PDF). sill-www.army.mil. ^ "The Longest Day: Trivia". IMDb. Retrieved 22 August 2009. ^ Sunshine, Linda (24 July 1998). Saving Private Ryan, The Men, The Mission, The Movie : A Steven Spielberg Movie. Newmarket Press. ISBN 1-55704-371-X. ^ Bentley, David (12 June 2008). "New Set Pictures: Hugh Jackman films Second World War scenes for Wolverine". Archived from the original on 15 June 2008. Retrieved 12 June 2008. ^ "War of the Worlds". imfdb. Retrieved 22 December 2010. ^ Staines, Daniel (January 2007). "Call of Duty 3". Hyper. Next Media (159): 60. ISSN 1320-7458. ^ "VMI Archives Online Photographs Database". Virginia Military Institute. Archived from the original on 20 July 2011. Retrieved 23 October 2007. ^ Mitchell, Martha (1993). "Wroth, Lawrence C." Encyclopedia Brunoniana. brown.edu. Archived from the original on 9 June 2008. Retrieved 3 June 2008. ^ "Papers on Milton Reckord". University of Maryland. Retrieved 21 August 2009. ^ Miller, Robert A. (1989). Division Commander: A Biography of Major General Norman D. Cota. Reprint Company. ISBN 978-0-87152-438-6. ^ * Ancell, R. Manning; Miller, Christine (1996). The Biographical Dictionary of World War II Generals and Flag Officers: The US Armed Forces. Westport, Connecticut: Greenwood Press. p. 457. ISBN 0-313-29546-8. OCLC 231681728. ^ Hobie (17 July 2016). "116th Infantry Regiment Roll of Honor: MAJ Thomas Dry Howie". ^ "Medal of Honor Recipients — World War I". United States Army. Archived from the original on 30 April 2008. Retrieved 24 April 2008. ^ "Medal of Honor Recipients — World War II (A-F)". United States Army. Archived from the original on 20 April 2008. Retrieved 24 April 2008. ^ "Medal of Honor Recipients — World War II (G-L)". United States Army. Archived from the original on 30 April 2008. Retrieved 24 April 2008. ^ "Medal of Honor Recipients — World War II (M-S)". United States Army. Archived from the original on 30 April 2008. Retrieved 24 April 2008. ^ "Medal of Honor Recipients — World War II (T-Z)". United States Army. Archived from the original on 4 May 2008. Retrieved 24 April 2008.